AFTER a loss of crops to the tune of Rs 800 crore during the Kosi floods, rotting of 3,400 tonnes of potato worth Rs 2 crore in a cold storage in Patna has dealt another blow to Bihar's farmers. The incident came to light on October 13, at a time when the state government was trying to win the farmers' confidence through a weeklong Farmers' Fair. It has also cast a shadow over the government's Rs 6,000-crore scheme called "Rainbow Revolution" to promote agriculture in the state. Owners of Bajrang Bali Cold Storage at Nasriganj, 20 km from Patna, where the potatoes were found rotting, blamed the state government for poor supply of electricity. But the storage's manager P K Sinha said the cooling chamber of the storage was not working properly. "Power supply in the area is erratic and we have to bank on generators to preserve the vegetables," Sinha said. A strict stand taken by the state government has compelled the owners to agree to pay compensation to the farmers who lost their yield. 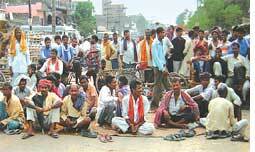 After the incident came to light, farmers from Deora, Hetanpura, Shankarpura, Dhudia, Kedalpura, Kafurpur and Akhilpur villages started an agitation on October 13 which lasted for three days. On October 16, Chief Minister Nitish Kumar addressed thousands of farmers during the inaugural ceremony of the Farmers' Fair at Gandhi Maidan. "The government will take strict action against all defaulters for failing to preserve vegetables, causing such a massive financial loss to farmers," he assured farmers. What is more disconcerting to farmers is that the nature of soil in flood-hit Purnia, Araria, Madhepura, Saharsa and Supaul districts is suspected to have changed after the floods. There is widespread fear that silt deposit after the receding of floodwaters might affect productivity. The state government has begun testing the soil but it's very slow. "We have sent a mobile laboratory for testing the soil of the flood-hit region. We will also organize farmers' meetings at the village and block level to appraise them of the nature of the soil and advise them on the kind of crops that can be grown in it if it's nature has changed," said agriculture minister Nagmani. Eager to bring agriculture back to track, the Bihar government has distributed high quality seeds of wheat, pulses and gram among farmers. The Rainbow Revolution aims to double the yield in farming, horticulture, fisheries, dairy and animal husbandry by 2015. Earlier this year, Kumar had declared 2008 as the Agriculture Year. Farmers still feel insecure. "We do not see a revolution. Rotting of potatoes has left us red with anger; our future seems to have been blackened by the floods," said Siddharth Sinha, one of the farmers who lost his potatoes.